Police in Bradford are appealing for witnesses after a robbery at a newsagents on New Line, Greengates on Tuesday night. The incident happened at around 9pm when three males approached a man who was outside the store closing up. They forced the victim to the ground inside the shop and demanded property. The victim was then forced into the back of the shop where another victim - a woman - was present. As this happened one of a trio remained with the two. He had what is believed to be a gun on him and a stick and told the two to get onto the floor as the other two people went upstairs. They then returned with a safe from the store and demanded the male victim give them his car keys, which he did. All three then made off through the back door, placing property into the victim’s car before driving off in it. Immediately before the incident the male victim saw a male in a garden on the other side of the road to the shop. This man then ran over towards houses further along the street. The victim went to see what was happening and then saw another two males. Three males then ran towards him. The first is described as aged between 20 and 22, of medium build and white. He spoke with a Yorkshire accent and was wearing a blue or black covered balaclava and other dark clothing. This was the man who ran over towards houses along the street. A second male officers want to speak to in connection with the incident is described as aged between 15 and 16. He was of a slim build and wearing dark clothing and had his face covered with kitchen roll. 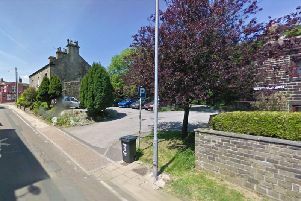 Detective Inspector Neil Benstead of Bradford CID, said: “Thankfully neither victim was seriously injured during this incident but it was a terrible and frightening ordeal for them to suffer. The stolen vehicle, a black coloured Volkswagen Touran Sport with the registration WR56 WOY, was found a short time later in Fagley Place. It had been set alight.